Day after day, I get countless emails asking for recommendations for products, services, etc… so I created this resource page to list those that I would recommend. This will quickly help you find a product or service instead of waiting for a reply from me. =) I will update this page as I find new products/services to recommend. Disclosure: Some of the products/services below may contain affiliate links, but these are all products I highly recommend. I never recommend a service/product that I have not personally used and verified. I cannot be bought! Ebates: Sign up for Ebates where can earn cash back while shopping online. I absolutely love Ebates because there is no code to remember. I downloaded their handy browser plugin which notifies me to activate Ebates if I am on a website where I can earn cash back. Last year while Christmas shopping (which I decided to do all online) I ended up with a $200 Ebates check in the mail! That was on top of any discounts and sale prices I paid online! MyPoints: MyPoints is similar to Ebates, however, you earn points for shopping online as well as other things such as reading email and doing surveys. I LOVE MyPoints and have been a member for YEARS! They also have a browser plugin that you can install that will alert you when you are on a website that you can earn points on. You can then trade the points in for gift cards to places such as Walmart, Lowes, etc… I typically cash out every couple of months with about $300 in gift cards! $5 Meal Plan: The $5 Meal Plan is a weekly meal plan service that takes the hassle of trying to figure out what’s for dinner and also helping you to eat more healthy while saving money. For just $5 a month, they will send you a delicious meal plan where every meal will cost about $2 per person, and in most cases less. Definitely worth checking out if you are anything like me (I hate planning meals and am looking to eat healthier). Oh and they are offering a free trial right now! Credit Karama: I have had a credit karma account for several years now. I was sceptical at first, but it is free and helps me keep my credit in check and an eye on my credit score. They recently just rolled out an update where you can also check your credit reports (from TransUnion & Equifax) for free as well. There is absolutely no credit card required (they don’t ask for it). Credit Sesame: Much like Credit Karama above, but I do like the web design of this site much better. I just signed up, so I am still testing everything out. It’s free to sign up and they do not ask for a credit card either. You can check your credit score for free, however, unlike Credit Karma if you want to check your credit report, it will cost you. Also, they only pull your credit score from TransUnion unlike Credit Karma which pulls it from TransUnion and Equifax. The one thing that does stand out is that Credit Sesame gives you $50k worth of identity theft protection insurance at not cost, just for being a member. MyPoints: I felt the need to add MyPoints in this section as well since you earn points for shopping online as well as other things such as reading email and doing surveys. I LOVE MyPoints and have been a member for YEARS! They also have a browser plugin that you can install that will alert you when you are on a website that you can earn points on. You can then trade the points in for gift cards to places such as Walmart, Lowes, etc… I typically cash out every couple of months with about $300 in gift cards! This is the #1 site that I earn the most from! 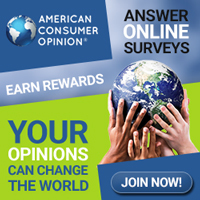 American Consumer Opinion® – This is one of my favorites and the points rack up pretty quickly. Even if you don’t qualify for a survey, you still get points. In addition to surveys, you may also qualify for product testing where you not only keep the product, but are also paid to test it! YouGov – This is actually one of my favorite ones. It is easy to earn points as the surveys are pretty short and your point rack up pretty quickly. Most surveys are generic but there are also a lot of government/political survey’s as well. Verizon – I have been a Verizon customer for over 10 years and besides having the nation’s largest most reliable network, they really do care about their customers and want to keep their customers. You may have read my post about how I saved over $500/month just by making two simple phone calls. When I was looking to trim my bills, I called Verizon to see what could be done. By the end of the phone call, my bill had dropped by $100 and nothing on my plan changed! I didn’t change to a lower plan and I didn’t remove anything. They simply did an “audit” of my account, found some discounts and boom I saved $100/month just by making a simple 10-minute phone call. Read more about my awesome experience with Verizon in an upcoming blog post. Until then, if you use my link, you will get $50 just for signing up!